Spelling bee winners announced » The Rocky Mountain Conference annual spelling bees took place last week in Montrose, Colo., and in Denver. 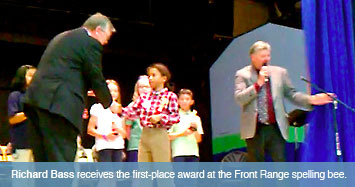 The Western Slope Region first-place winner was Luis Joya, a student at Columbine Christian School in Glenwood Springs, Colo. Richard Bass, a student at Vista Ridge Academy, in Erie, Colo., came in first place for the Front Range Region. Congratulations Luis and Richard! All your hard work paid off. 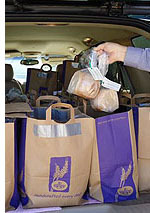 Church members share loaves of bread with community » Jack Bohannon, an elder at the Colorado Springs South Church, shared that on the Sabbath afternoon before Easter Sunday, four teams from the church distributed 300 half-loaves of bread from a commercial bakery to homes in the church's surrounding community. Attached to each loaf was a card referring the recipient to the Bread of Life who loves them. On the back of the card was printed the name and address of the church. The church family has made serving their community a priority in ministry. 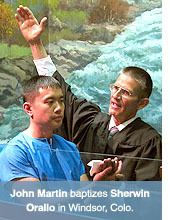 John Martin, lay pastor at the Elm Haven Fellowship, baptized Sherwin Orallo on Sabbath, April 24. Sherwin met Elias Garcia, an Elm Haven member, while in the military. After his discharge, Sherwin moved to the Windsor area and continued his friendship with Elias. After several years of studying the Bible and attending Elm Haven, Sherwin decided he had found the truth he was searching for and wanted to become a member of the great Seventh-day Adventist family. The Campion Church has participated in the 9 News Health Fair for eight years running. This year was no exception. 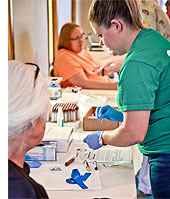 The health fair provides low-cost blood work, free screenings of diverse types, and health education sessions. This year, the church gathered a group of 110 volunteers and served 450 people from the Loveland community and surrounding areas. Free lawn care builds friendships » Newday Christian SDA Church members in Parker, Colo., have been serving their community in practical ways. 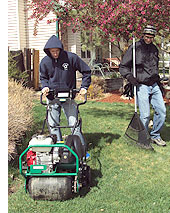 Sunday, April 15th, eight Newday teams offered residents of one neighborhood totally-free lawn aeration services. The lawn aerating event followed Newday’s totally-free fall leaf-raking event five months earlier in the same neighborhood. Their approach? Knock on a door, ask if the yard can be aerated completely free, and leave a business-size card that says on one side, “It’s Free…. Seriously,” and on the other side, simply lists their church's website. One Newday Church member said, “We were blessed with smiles, conversations and gratefulness from neighbor after neighbor as they grappled with the idea of ‘free-with-no-strings-attached.’” Check out Newday’s fun 3-minute video of the event. On the road » This Friday evening, my wife, Diane, and I have the privilege to participate in the ordination of Chris Evenson, pastor of the Franktown, Colo., and Aspen Park, Colo., churches. The service will take place at the Franktown Church at 7:00 p.m. A reception will follow. Please pray for Pastor Chris and his wife, Lisa Evenson, as they continue to serve our Lord and their church families. On Sabbath, Diane and I will worship with the Campion Church family in the morning, and will participate in the NE Colorado Town Hall at the Campion Church at 6:30 p.m. Wherever you worship on Sabbath, I pray each of you will have a blessed experience with Jesus.